Colorized Enhanced IR Image with Guam located in the middle, CLICK image for loop. Click image to display full-sized loop in separate tab. Rainbow Enhanced IR Image with Guam located in the middle, CLICK image for loop. North-West Pacific Surface Analysis 00UTC (10AM ChST) Chart. Click Surface Chart image above to display full image in separate browser tab. North-West Pacific Surface Analysis 06UTC (4PM ChST) Chart. North-West Pacific Surface Analysis 12UTC (10PM ChST) Chart. North-West Pacific Surface Analysis 18UTC (4AM ChST) Chart. WindGuru's JPC/Togcha Bay 72 Hour Model Forecast Derived from GFS & WW3 Models. Click WindGuru Logo above to open WindGuru 172 Hour Model Forecast in separate tab. 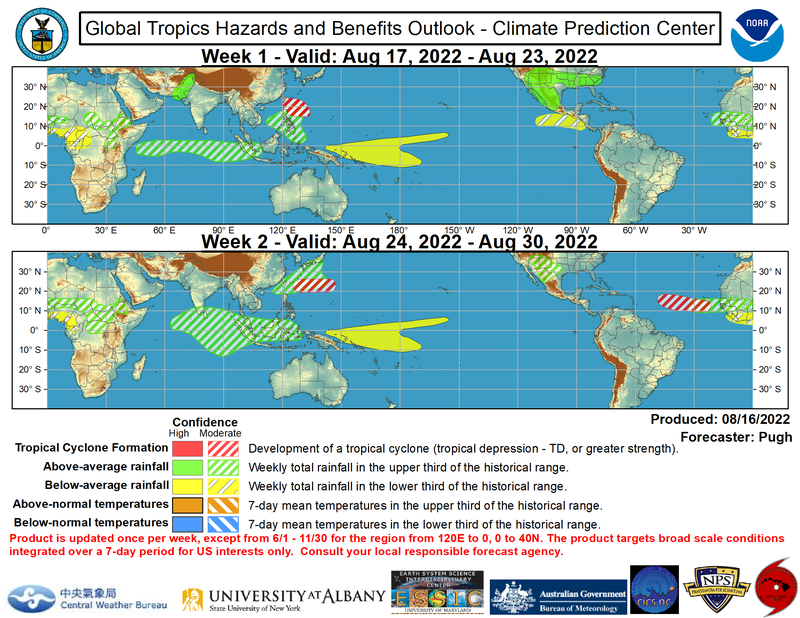 Global Tropics Hazards Rainfall & Tropical Cyclone Formation Outlook Prediction. Click above image to display in separate browser tab. Note the plus (+) sign indicates current tide level at this location. Click above tide chart for full sized view in separate tab. 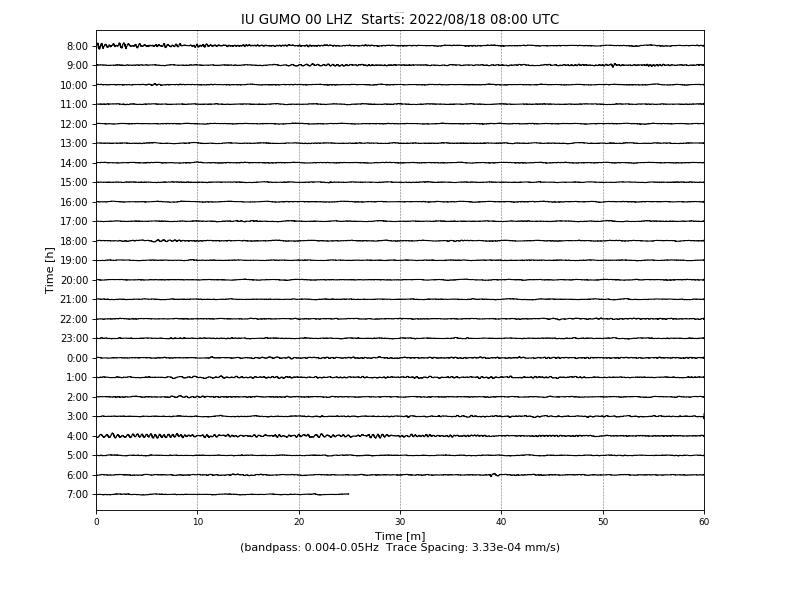 When following Earthquake links, note that Guam Chart time is in UTC or Z (Zulu) time. Click Seismic image above to display full image in separate browser tab. Click image above to display in separate browser tab. Interested? Give us a call @ 789-COVE (2683). Call 789-COVE (2683) for Reservations ! JPC restaurant diners receive a 20% DISCOUNT on ALL purchases over $10.00 from our JPC Gift Shop. We have lots of our original JPC T-Shirts in stock with new arrivals each week. Use Main Menu (Front/Back) for your TOGO Orders @ 789-TOGO (8646) ! JPC WX Station images updated when available..
REFRESH PAGE to display the latest image/s. Image changes/updates every 10/mins. during daylight hours. REFRESH PAGE for most recent daytime image. Hovering on feed content will enable pausing/scrolling. NOTE: STATION OB LINKS NO LONGER IN SERVICE, NO ETR. REFRESH PAGE for latest RSS Headline Updates. Refresh page to get the latest loop images. Guam Radar Full Feature Viewer in separate browser tab. Weather Underground (WUG) archive is the most complete. * Note: 1800Z Monday the 1st is 4 AM or 0400 L Tuesday the 2nd. Please Support Our Weather Pirate Link Trader Sites ! Click above logo to visit our live traffic partner. Disclaimer - Weather information is provided without warranty of any kind as to accuracy or timeliness, and should NEVER be used to make IMPORTANT decisions during a weather emergency. The user assumes the entire risk related to the use of this data. Jeff's Pirates Cove (JPC) is providing this data "as is", and JPC disclaims any and all warranties, whether express or implied, including (without limitation) any implied warranties of merchantability or fitness for a particular purpose. In NO event will JPC be liable to you or to any third party for any direct, indirect, incidental, consequential, special or exemplary damages or lost profit resulting from any use or misuse of this data. JPC also provides links to various weather related sites because they may contain related information of interest to you. These links DO NOT constitute an endorsement by JPC of any information, products or services found on these sites. DON'T BELIEVE A WORD YOU READ ON THIS OR ANY OTHER WEBSITE ON THE INTERNET ! - Comments and/or suggestions? Give us a call @ 789-COVE(2683). We are viewed by action sports enthusiasts needing Guam weather information. Our links take you to the best Guam weather, typhoon, earthquake, tsunami and ocean tides information. Guam weather and storm information is provided in 'real time' with updates every 2 to 5 seconds. Come and enjoy our great beach location at Jeff's Pirates Cove, we have the best home made cheeseburgers on Guam. Our beer is always cold, we have red rice and BBQ ribs and chicken keleguen. 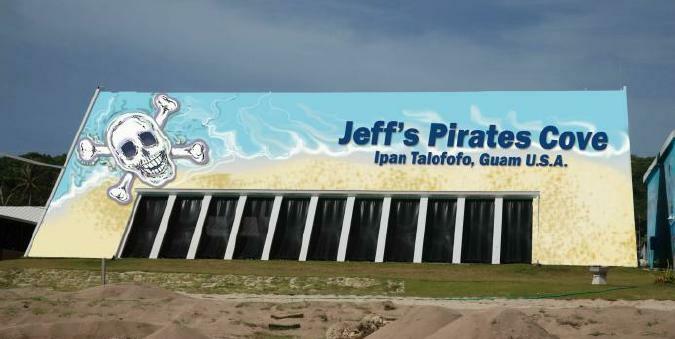 Guam's best kite/wind surfing spots is right in front of Jeff's Pirates Cove on Guam. Daily tours of Jeff's Pirates Cove are available, jungle ride with coconut demonstration. Up to date Guam weather information from Jeff's Davis Weather Station via our website "weather.jeffspiratescove.com". Surf and tide forecasts from the National Weather Service Guam Office for Guam waters. Jeff's Pirates Cove Weather Center is the best source for the latest typhoon tracking information. View live video stream from our Pirate CAM during Guam's daylight hours. RSS feeds displayed by Jeff's Pirates Cove Weather Center on Guam include Apra Harbor, Andersen Air Force Base, and NWS Guam observations, active watches, warnings and advisories, typhoon warnings and Ipan Buoy wave height feeds. Latest satellite and weather radar images for Guam are displayed along with current tide information from the Pago Bay Guam tide station. Jeff's Weather Center also places real-time NWS observations taken at Guam International Airport into it's weather station trends image every 30 minutes. Current weather information for Guam surfers, windsurfers, kite boarders, kayakers, paddlers, stand-up-paddlers (SUP), sailors, boaters, fishermen, reef walkers and all beach goers. Both Weather Underground (WUG) and Jeff's Weather Center wind statistics are displayed in near real-time and 10 minute history graphs. Jeff's Weather Center archives it's weather station data at several locations, the Weather Underground (WUG), the Citizen Weather Observer Program (CWOP) and the Automatic Weather Map System (AWEKAS). Our off-site storage sites should be bookmarked for access should our server be down. We use Davis weather station equipment and Ambient Weather Virtual Weather Station software to drive our data to multiple sources. We have links to Jeff's Pirates Cove main website, and Jeff's Coral Reef Home where we've compiled information on the Pirates Cove history and the effects of pollution on the Cove's reefs. Looking to buy a home on Guam, need a map of Guam to find Jeff's Pirates Cove, want to contact Guam realty sites, have shipping requirements to Guam, have you booked your hotel rooms on Guam, like to golf while visiting Guam, find Guam insurance providers or just find out more information on Guam. 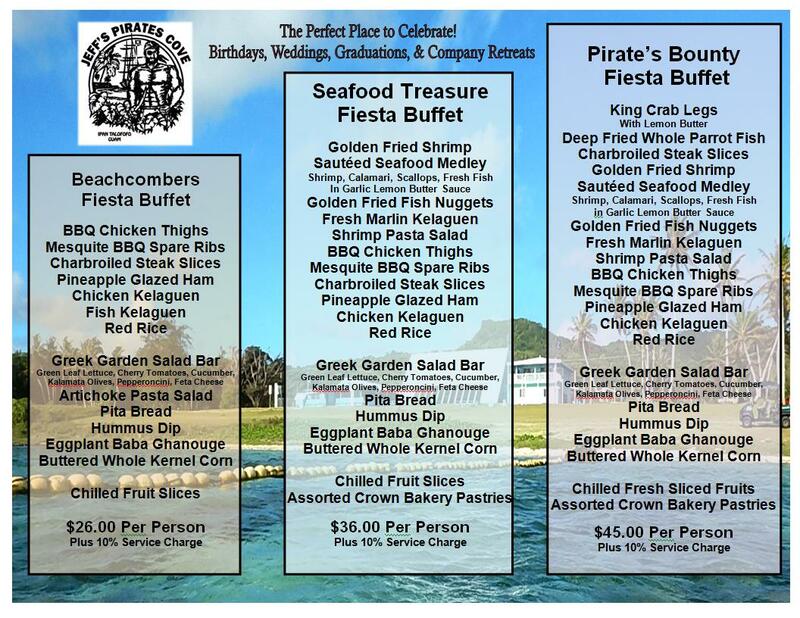 Book a day tour to Jeff's Pirates Cove at 671-789-COVE (2683). As of January 2017, Uncle Morty is no longer affiliated with JPC, this website or the Davis Weather Station at JPC.